The K-Standard system is a design regularly used by the commercial industry and is the industry standard. It is typically made with Moisture Resistant MDF or Ply Board that has been laminated to either a high or low pressure laminate on both sides. It is finished with aluminium clashed edgings, a powder coated aluminium pedestal and our stainless steel locks, coat hooks and fasteners. The K-Clashed system is made from laminated board with 2mm PVC edging applied to all facing edges. 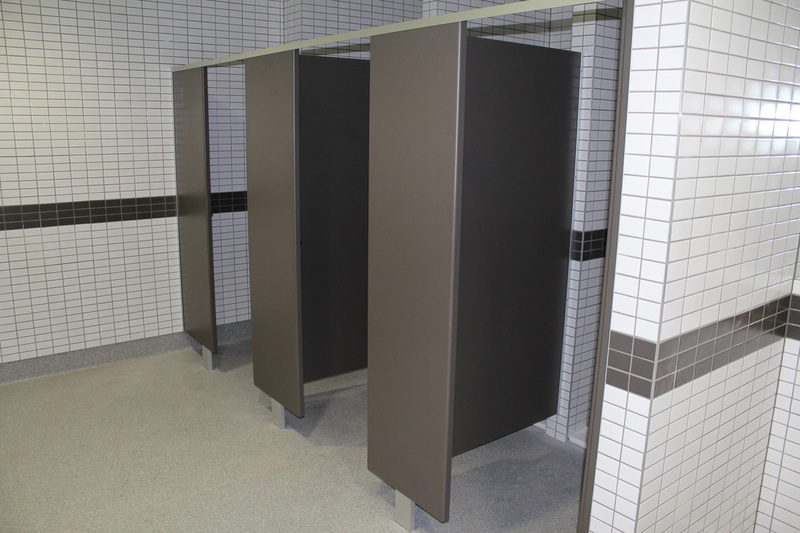 This system features Stainless steel pedestals on the front panels to provide strength and durability. It is best used in environments such as offices, bars or restaurants where this system shines, providing you with an affordable high end product. This is available in a wide range of low and high pressure laminates and is complemented by the Kermac stainless steel hardware and fastenings. 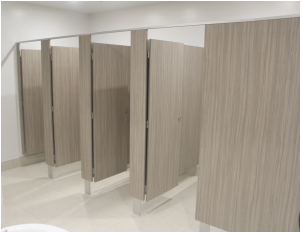 The K-Compact system can be constructed in multiple different compact laminate options including Laminex, Kermac or Swiss CDF branded compact laminate. Compact laminate is a strong, durable and moisture resistant material. While this system is strong, robust and widely applicable to many situations, it is also one of our affordable solutions. 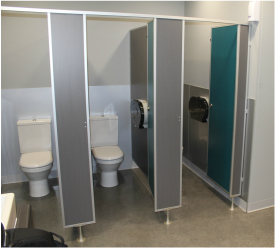 It is very popular in schools, gyms, public toilets and stadium rebuilds. New design hardware makes this hard to beat for cost and reliability. The K-Moda system changes the classic partition look to modern design features. K-Moda features aluminium blade mounted pedestals with updated Kermac hardware. The K-Moda system is available in a wide range of materials with the ability to choose from board size in 13mm compact/CDF, 18mm Structural Board/Melteca or 30mm Melteca thickness front panels. Design features are slimline jointing on panel extensions and Privacy brush to all doors. It achieves all of this with the same quality and affordability of previous system designs. 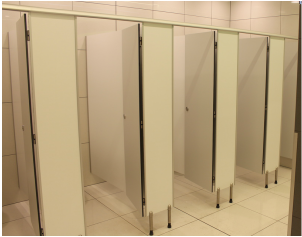 ​The defining feature of the K-Tophung system is the bold overhead support beam which allows suspension of the cubicles without pedestals on the front panels. Removal of pedestals from the front panels provides a modern suspended design to enhance any bathroom's aesthetic. The system is available in our full range of panels including 13mm KerMac compact laminate and 18mm Melteca LPL/HPL. The K-Primo system is constructed from compact laminate or Swiss CDF Board which makes for strong, robust and moisture resistant material choices. While this system is strong, material choices can be changed according to budget. 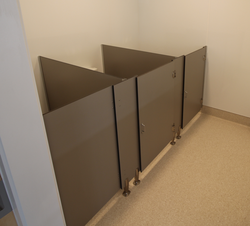 This system is also one of our flexible designs by providing three pedestal options. K-Primo is an excellent choice for wet area applications such as Shopping Centres, Gyms, Stadiums and Airports (Swiss CDF not applicable for Shower application). The K-Freestanding system is one of our top end systems which requires no head-rail. It is available in 13mm compact laminate and 18mm Structural Board/Melteca laminate. There is also an option for 30mm front panels in Structural Board/Melteca laminate. It is only available in buildings that have concrete slab floors as it needs to be securely fastened to the floor with our KerMac rod system. This system offers peak performance in style and usability.